Facility Solutions Inc. A large foodservice industry consulting firm involved in nation-wide project management. The company has hundreds of active sites at any given point of time and has thousands of contractors they work with. 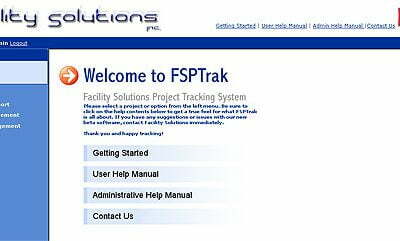 Facility Solutions Inc. used several different applications, including email, Microsoft Project and Excel, for tracking development, updates and status etc. Some of those applications were really hard to adapt to the work process in their organization. All the information was kept in different places. Very often their employees were using spreadsheets, passing them back and forth via email. The project managers were always busy collecting updates and making sure everyone had the right information. The real challenge was to get the whole picture of what was going on in the company. The company has employees who visit customers for maintenance and thus required a solution, which could send the customer information immediately from the customers place. A custom online workspace was the solution proposed by Pulse information architects, the system is capable of running multiple activities in a online hosted web application. Tasks are now neatly organized in projects under specific active sites / clients and can be tracked in several different ways. Data from several sources is combined to form projects, which can have millions of individual components. Each component is assigned to a contractors and can be independently secured, monitored and tracked. The software supports importing data from any spreadsheet irrespective of column headers, a project can be swiftly defined from ground up using data from an unstructured spreadsheet, this is an essential feature as projects at Facility Solutions can be very varied requiring over 150 unique parameters. Contractors can use mobile devices like PDAs and Cell phones to access the system while on the field to review requirements and upload updates including pictures and videos of before and after a job has been executed. The system uses AJAX and other advanced web technologies like Flash and mobile apis to achieve a set of stringent accessibility, speed requirements from Facility Solutions, Inc. The software was built to be fast loading, easy to understand and simple to maintain, it has excelled at each one of these requirements. Looking at the success of the model the software was modified to be leased out to similar companies, each corporation can segregate its data using an intuitive security system that allows security starting from clients and projects to specific row and column levels. The software has improved productivity and efficiency many times over. Clients can now see the work being performed in real time when contractors upload images right from their cell phones. Management has been able to make accurate decisions quickly as the information is now readily available. Accessibility through a cell phone has made contractors very happy people who picked up on the system in the first few days of launch. Facility Solutions, Inc expects to do more business than ever before using this intuitive piece of software that has redefined how they do business.